Abstract: We present an interpretation of Inception modules in convolutional neural networks as being an intermediate step in-between regular convolution and the recently introduced "separable convolution" operation. In this light, a separable convolution can be understood as an Inception module with a maximally large number of towers. 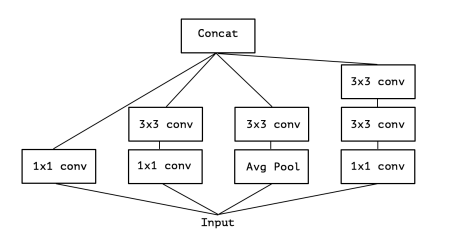 This observation leads us to propose a novel deep convolutional neural network architecture inspired by Inception, where Inception modules have been replaced with separable convolutions. We show that this architecture, dubbed Xception, slightly outperforms Inception V3 on the ImageNet dataset (which Inception V3 was designed for), and significantly outperforms Inception V3 on a larger image classification dataset comprising 350 million images and 17,000 classes. Since the Xception architecture has the same number of parameter as Inception V3, the performance gains are not due to increased capacity but rather to a more efficient use of model parameters. The idea behind Inception modules was to look at cross-channel correlations ( via 1x1 convolutions) and spatial correlations (via 3x3 Convolutions). The main concept being  that cross-channel correlations and spatial correlations are sufficiently decoupled that it is preferable not to map them jointly. This idea is the genesis of Xception Net, using depth-wise separable convolution ( convolution which looks into spatial correlations across all channels independently and then uses pointwise convolutions to project to the requisite channel space leveraging inter-channel correlations). Chollet, does a wonderful job of explaining how regular convolution (looking at both channel & spatial correlations simultaneously) and depthwise separable convolution (looking at channel & spatial correlations independently in successive steps) are end points of spectrum with the original Inception Nets lying in between. Input for would be images that are used for classification  along with corresponding labels.